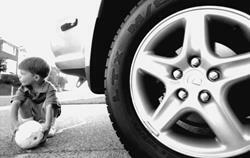 When a driver backs a vehicle from a driveway or other parking space, the driver can easily fail to detect the presence of a small child behind the vehicle. All drivers must be aware of this danger and exercise extreme caution when driving or backing up in areas where children may be present, such as school zones, near playgrounds, or in neighborhoods. If your child has been injured in a vehicle backup accident, you may be entitled to compensation from the individual responsible. Contact child vehicle-backup lawyer Jeffrey Killino at 877-875-2927 to learn more about your legal options. Children—particularly those under the age of two—often fail to comprehend the harm a motor vehicle can cause and are not likely to react as an adult would when a car starts to back up in their direction. Children under two years of age are the most common victims of vehicle-backup injuries because of their small size and lack of understanding regarding vehicle hazards. Drivers who back up their vehicles in areas in which children may be present must take the care to check behind the vehicles for the presence of children. SUV’s, trucks, vans, and other large automobiles pose the greatest danger of back-up accidents, especially when drivers rely only on their rearview mirrors to determine what may be behind them. In April 2014, the National Highway Traffic Safety Administration (NHTSA) issued a rule that will require new vehicles weighing less than 10,000 pounds (including buses and trucks) built on or after May 1, 2018, to meet new rear-visibility standards intended to reduce injuries and deaths caused by vehicle backup accidents. The vehicles will be fitted with rear-view cameras that provide drivers with a field of vision equal to or greater than 10 by 20 feet directly behind the vehicle. Liability for accidents involving motor vehicles, including those in which a pedestrian is injured, is generally determined in an action for negligence against one or more drivers. In some cases, a vehicle defect may be determined to have been a cause of a vehicle accident and/or resulting injuries, so that liability may be attached to the vehicle’s manufacturer and anyone in the chain of the vehicle’s distribution. Most vehicle backup accidents that involve a collision between a vehicle and a pedestrian child occur as a result of driver negligence rather than a defect in the vehicle. In order to establish liability on the part of a driver in a vehicle backup accident, the plaintiff will need to prove each element of a negligence action by a preponderance of the evidence. Proof by a preponderance of the evidence requires a showing that it is more likely than not that something occurred. Every driver owes a duty to pedestrians and other drivers to follow the rules of the road and to take precautions against causing accidents and resultant injuries to persons or property. This duty of care arises as soon as a driver gets behind the wheel of a motor vehicle. A driver’s duty of care includes the duty to ensure that no one is behind the driver’s vehicle when the driver is backing up. Shouting or honking a horn—or using a vehicle that has a backup alarm—may not suffice in a neighborhood or other area in which children are present, as young children are less likely than adults to heed such warnings. If a driver violates traffic laws or rules of the road, the driver may be found to have violated his or her duty of care toward any individual who is injured as a result. A driver’s breach of the duty of care owed to pedestrians may occur if a driver fails to yield the right of way to pedestrians in a crosswalk, fails to obey traffic signals, and fails to watch for pedestrians who are in a roadway or at a curb or street-edge. In the context of vehicle backup accidents, particularly those that occur in areas in which children are known or reasonably should be known to be present, a driver’s failure to take precautions beyond looking in rearview mirrors before backing up may constitute a breach of the driver’s duty of care. In certain cases, the driver’s duty may be found to have been breached if the driver failed to get out of the vehicle before backing up to ensure that no children were behind it. In order to recover damages in a negligence suit brought against a motor-vehicle driver, the plaintiff must prove that it is more likely than not that the driver’s breach of the duty of care owed to the plaintiff was a cause of the plaintiff’s injuries. The plaintiff must establish both the existence of an injury or injuries as well as the causative link between those injuries and the defendant’s breach of the duty of care. Damages are the legally compensable results of a plaintiff’s injuries and are a separate element of proof. Damages may include the costs of past and future medical expenses, compensation for a plaintiff’s pain and suffering, costs of surgeries, lost earning capacity, physical and other therapies, and the costs of needed adjustments to homes or vehicles to accommodate certain injuries. In some cases, punitive damages may also be awarded. Punitive, or punishing, damages are generally allowed only in cases in which the defendant has been shown to have engaged in reckless or egregious conduct that resulted in the plaintiff’s injuries. If your child has been injured in a vehicle-backup accident due to someone’s negligence, contact child-injury lawyer Jeffrey Killino at 877-875-2927 for compassionate and experienced assistance with your case.